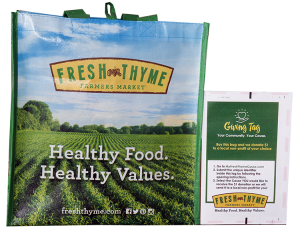 We have been chosen by the Fresh Thyme located in Menomonee Falls as the latest non-profit to benefit from the Fresh Thyme Giving Bag Program. This means that for the entire month of April, Menomonee Falls Public Library will receive the $1 donation every time the Giving Bag is sold, unless otherwise directed by the customer through the Giving Tag. All you have to do to support the Library is go to the the Fresh Thymelocated in Menomonee Falls throughout the month of April and pick up the bag! Thank you for your support. For more information on the Fresh Thyme Giving Bag Program, visit freshthyme.bags4mycause.com.